in cooperation with Asennemedia & Vallila Interior. For the whole past autumn I’ve been somehow resenting Christmas. Whenever I’ve been talking about it with friends or family or thought about any gifts, decorations, parties or anything, there has been this loud voice yelling ‘NO NO NO’ in my mind. Instead of being excited I started to feel anxious and began to dream of running away to somewhere warm and imagined myself drinking fresh coconut water instead of mulled wine. How great that would be? So as I noticed these feelings going around, I decided that this year I don’t have to do any of the usual Christmas things. And instead of being that hyper person I sometimes turn into this time of the year, I’m going to be the super chill one that hasn’t even heard about stress. My inner rebel started to feel a bit uncomfortable with all these happy thoughts. Maybe I’ll give up and become that hyper person or the rebel in me will maintain its strength and I’ll skip most of the hassle and just focus on a few of my favorite things. We’ll see how things work out, but I managed to create something rather delicious in this sudden burst on excitement. 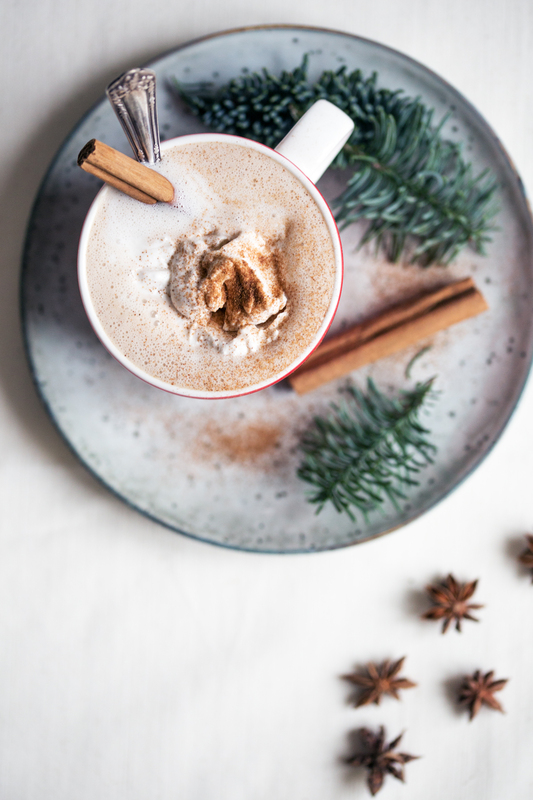 So let me present the most wonderful drink for the upcoming season: Gingerbread Latte! 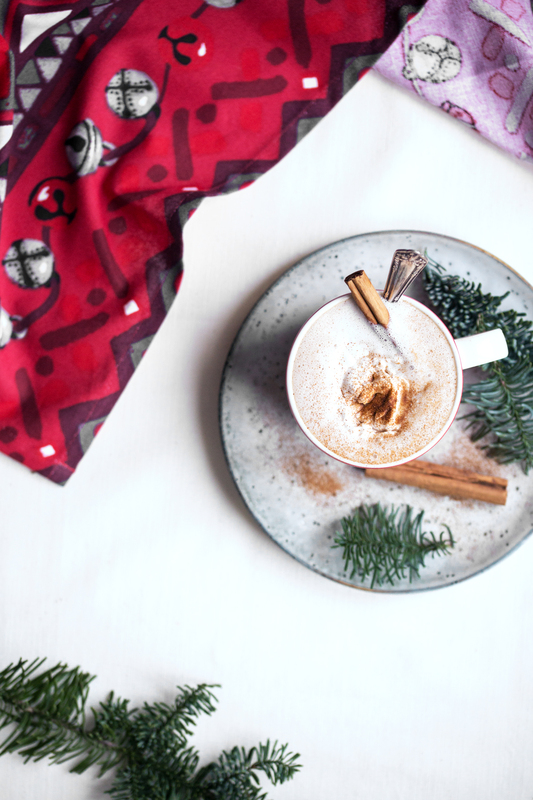 This warming gingerbread latte actually happened on the spur of the moment. I’d had these cups and kitchen cloths from Vallila’s new Christmas collection for a while already, as I was asked to style them with a christmassy recipe. I had thought about making some sort of a fancy dessert but then I hit me: a huge craving for gingerbread spices and something warm. I went through our cupboards, picked up a few things, threw them into a blender, poured the super creamy drink into a saucepan and heated it for a while until it was warm. A wonderfully creamy and spicy drink, that’s just perfect for these cold days. Before curling up to the sofa with the warm cup, I decided to go all out and whipped some coconut cream on top of the drink. Delicious. I saved the rest for later and drank it cold. Delicious as well! So besides being a warm latte, this one’s like a smoothie too, which makes it a great dessert for any upcoming parties. Or screw the parties, make it just for yourself and take some luxurious me-time. And while your having a cup, maybe you’ll set your inner Christmas fanatic out or dream wildly of that runaway trip to somewhere warm. 1. Add the cashews into a blender and grind until fine flour. (You can also soak the cashews for 6-8 hours if you like and then skip the grinding.) Add oat milk, coconut milk, dates and spices into the blender and blend until creamy and smooth. Taste, and add more dates or spices if desired. 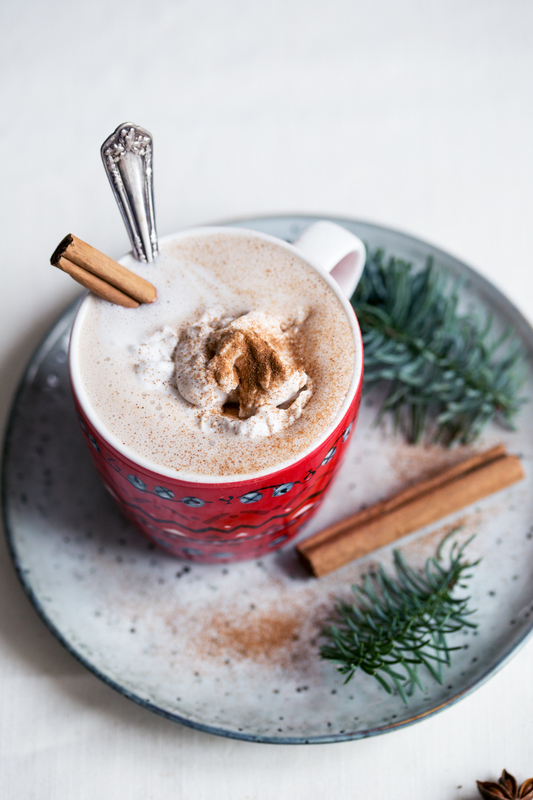 If you’d like to top the drink with Gingerbread Coconut Cream, prepare it before heating the drink. 2. Pour the drink into a small saucepan and heat on low-medium heat until the drink is warm enough. 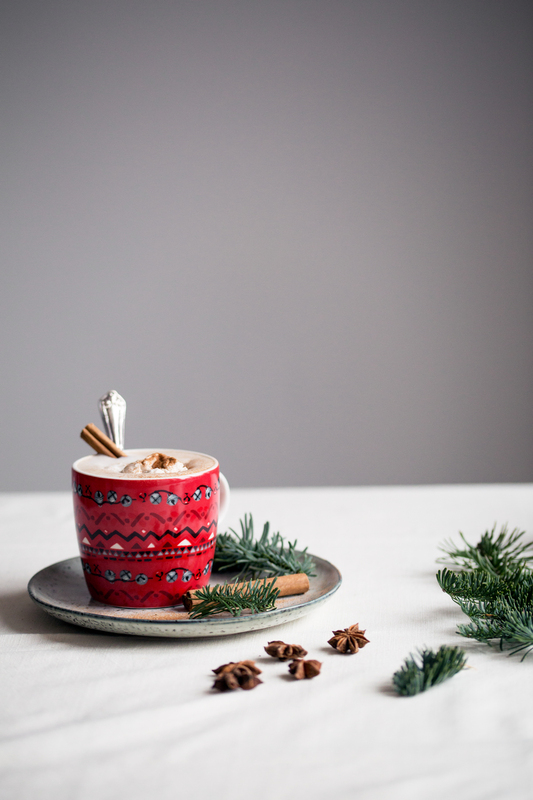 Pour into mugs, top with Gingerbread Coconut Cream and sprinkle some cinnamon on top. Serve and enjoy! Open the coconut milk can and scoop out the thick white cream into a big bowl. Beat with a mixer until creamy. Add sweetener and spices and mix until creamy and smooth. Taste and adjust sweetness as needed. If the mixture is too runny, place it in the fridge for a while. Store the leftover cream in the fridge and use within 3 days. Tagged christmas, gingerbread, vegan, warm drinks, winter. I love, love, LOVE this post. I too get frazzled by the expectation of celebrating Christmas the traditional way. 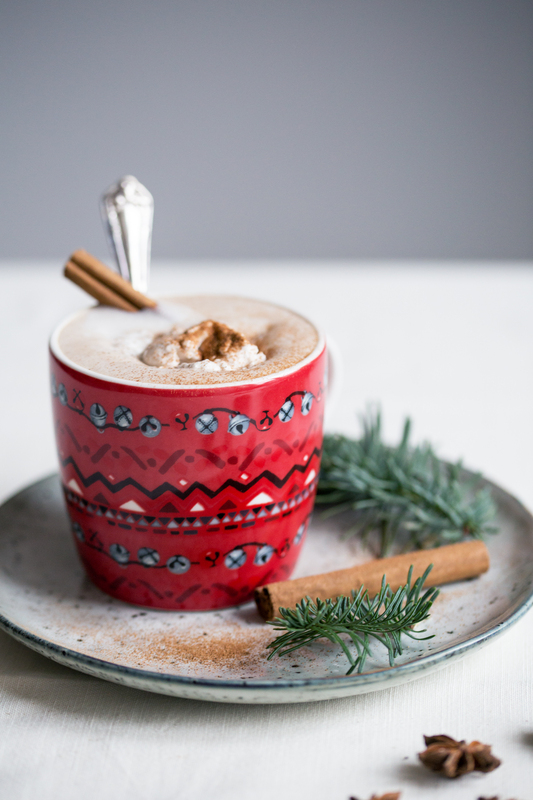 However, I am a sucker for rich cinnamony drinks during cold weather so I will be sipping this shortly! Gorgeous photos, by the way.